NUMBERS Is it possible to select all the cells that share the same background colour on an existing table? I have a large(ish) table, which is 75 rows, and 120 columns. so, 9000 cells. They are all empty of data, but some of them have their background fill set to Colour A, and some have it set to Colour B.
I would like to be able to select all the cells that are currently showing as Colour A cells, and change their background fill in one go, rather than have to sit for hours on end, manually selecting the cells individually. Is this possible, or do I have a long night ahead? Not the answer you're looking for? Browse other questions tagged macos numbers . Numbers: is it possible to add multiple select elements? How can I make two cells edit and display the same information in Numbers? How to select or autofill all distinct elements from a column in Numbers? 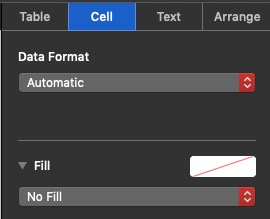 Is it possible to swap two cells content in numbers? Is there a way to reverse the order of rows in a chart?